You'll begin by painting with white to increase the selected area within the egret. This erases some of the mask. 1 To make the foreground color white, select the Switch Foreground and Background Colors icon above the foreground and background color-selection boxes. 2 Select the zoom tool( 0 and magnify your view of the image, if needed. Many times when you are editing an image, you'll need to zoom in to work on a detail and then need to zoom out again to see the changes in context. You can use various keyboard shortcuts that make it easier than constantly switching between editing tools and the zoom tool. • Click the zoom tool in the toolbox to switch from the currently selected tool. • Hold down Ctrl+spacebar (Windows) or Command+spacebar (Mac OS) to temporarily select the zoom tool from the keyboard. When you finish zooming, release the keys to go back to the tool you were using. • Click the area you want to magnify. Each click magnifies the image by the next preset increment. 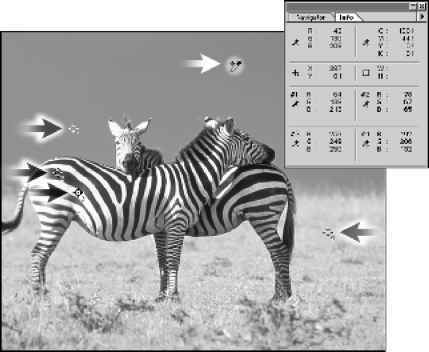 • Drag around the part of the image you want to magnify, creating a zoom marquee. When you release the mouse, the image portion within that marquee fills the image window. • In the toolbox, double-click the zoom tool to return the image to 100% view. • Hold down Alt (Windows) or Option (Mac OS) and click the area of the image you want to reduce. Each Alt/Option-click reduces the image by the next preset increment. 4 In the tool options bar, make sure that the mode is Normal. Then click the arrow to display the Brushes pop-up palette, and select a medium-sized brush, such as one with a diameter of 13 pixels. Note: You'll switch brushes several times as you do this lesson. For convenience, you can choose Window > Brushes to open the Brushes palette as a separate window (or drag its tab from the palette well) so that your brush choices are readily available as you work. Or, you can just click the Brushes tab in the palette well to open it temporarily. 5 Using the brush tool, begin painting over the red areas within the egret's body. As you paint with white, the red areas are erased. Don't worry if you paint outside the outline of the egret's body. You'll have a chance to make adjustments later by masking areas of the image as needed. 6 Continue painting with white to erase all of the mask (red) in the egret, including its beak and legs. As you work, you can easily switch back and forth between Quick Mask mode and Standard mode to see how painting in the mask alters the selected area. Notice that the selection border has increased, selecting more of the egret's body. * For an illustration of the selection in Standard and Quick Mask modes, see figure 6-1 in the color section. If any areas within the body of the egret still appear to be selected, it means that you haven't erased all of the mask. 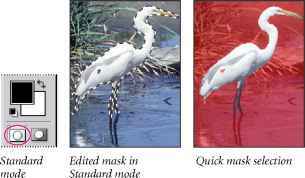 7 Once you've erased all of the red areas within the egret, click the Standard mode icon (E3) again to view your quick mask as a selection. Don't worry if the selection extends a bit beyond the egret. You'll learn how to fix that later. 8 If necessary, zoom out so that you can see the entire image.